The two brothers who were interrogated by police investigating the alleged Chicago street attack on actor Jussie Smollett claim they helped him concoct the assault after he became upset that a letter threatening him, sent to the "Empire" show's studio, did not get enough attention, sources told ABC News on Monday. Olabinjo and Abimbola Osundairo have also told investigators that Smollett paid them to help him orchestrate and stage the Jan. 29 attack that he said occurred near his Chicago apartment, sources said. A letter threatening Smollett was sent Jan. 22 to the Fox studio in Chicago where "Empire" is filmed, police said. The letter contained threatening language and was laced with a powdery substance investigators believe was likely crushed-up Tylenol, police said. The Osundairo brothers told the investigator that Smollet allegedly decided to stage an attack on himself because he felt the letter didn't get enough attention, the sources told ABC News. Detectives are actively investigating the account of Olabinjo and Abimbola Osundairo, but thus far police have not independently verified the allegations, a law enforcement official briefed on the investigation told ABC News. The Osundairo brothers agreed to cooperate with authorities after detectives confronted them with evidence that they bought the rope -- allegedly used in an attack that Smollett described to police as laced with racial and homophobic slurs -- at a Chicago hardware store, sources said. Smollett also claimed the attackers shouted "MAGA country," an apparent reference to President Donald Trump's slogan "Make America Great Again." "We are not racist. We are not homophobic and we are not anti-Trump. We were born and raised in Chicago and are American citizens," Osundairo brothers said in a statement to CBS Chicago affiliate WBBM that has been confirmed by ABC News. Detectives have now shifted the investigation towards determining whether Smollett made up the entire story, sources said. Anne Kavanagh, a spokeswoman for Smollett and his legal team, said the actor had no plans to meet Monday with Chicago police, who said they are "eager" to speak with him again about the latest developments in the investigation. Kavanagh said Smollett's attorneys are keeping an active dialogue going with Chicago police on behalf of the actor. The latest twist in the probe came after Smollett hit back at the suggestion that the incident was a hoax, and expressed disbelief that the brothers could have been involved. "As a victim of a hate crime who has cooperated with the police investigation, Jussie Smollett is angered and devastated by recent reports that the perpetrators are individuals he is familiar with," Smollett attorneys Todd Pugh and Victor Henderson said in a statement Saturday. "He has now been further victimized by claims attributed to these alleged perpetrators that Jussie played a role in his own attack. Nothing is further from the truth and anyone claiming otherwise is lying. The attorneys said that Smollett has been cooperating with the police throughout the investigation. After initially being considered persons of interest, the Osundairo brothers were detained and became potential suspects, police said. When they were threatened with battery and hate crimes charges, they agreed to work with detectives, sources told ABC News. The dramatic shift in the probe is the latest in the fast-changing story that started with Smollett reporting to police that he was attacked in the early morning hours of Jan. 29. By Saturday evening, however, Chicago police said they were "eager to speak to Jussie Smollett" after the interrogation of the Osundairo brothers, who police said are U.S. citizens of Nigerian descent. "We have been in touch with Smollett's attorneys," Chicago Police spokesman Anthony Guglielmi told ABC News Sunday afternoon, adding that investigators "are waiting on whether they're going to get a response from his attorney." Guglielmi said the department contacted the actor's lawyers Friday night. "We made our intentions clear," he said. On Sunday afternoon, Guglielmi posted a statement on Twitter, saying, "While we are not in a position to confirm, deny or comment on the validity of what's been unofficially released, there are some developments in this investigation and detectives have some follow-ups to complete which include speaking to the individual who reported the incident." A spokesperson for Fox, which broadcasts "Empire," declined comment on Saturday night. Early Saturday, after the brothers were released, police said they had new information that "could change the story entirely." Police confirmed that Olabinjo and Abimbola Osundairo were the two men seen in surveillance images from the night of the alleged incident. They were taken into custody on Wednesday night and interviewed by detectives in the following days. Based on the video evidence that police discovered, it did not indicate anyone else was there at the scene of the alleged incident, police said. But on Saturday, after their release the night before, police said the brothers were no longer potential suspects and again persons of interest, saying that they may still have information that is helpful to the investigation. Smollett told police that on Jan. 29, he was walking on a street near his apartment when he was attacked by two men. The attackers allegedly shouted racist and homophobic slurs before hitting him, pouring "an unknown chemical substance" on him - possibly bleach - and wrapping a rope around his neck, he told detectives. Police confirmed phone records show that during the attack, Smollett was on the phone with Brandon Moore, his music manager. Both claimed that the alleged attackers yelled "MAGA country." While Guglielmi said on Saturday that he could not speak on what the new information was, he said that detectives had "shifted the trajectory" of the investigation. 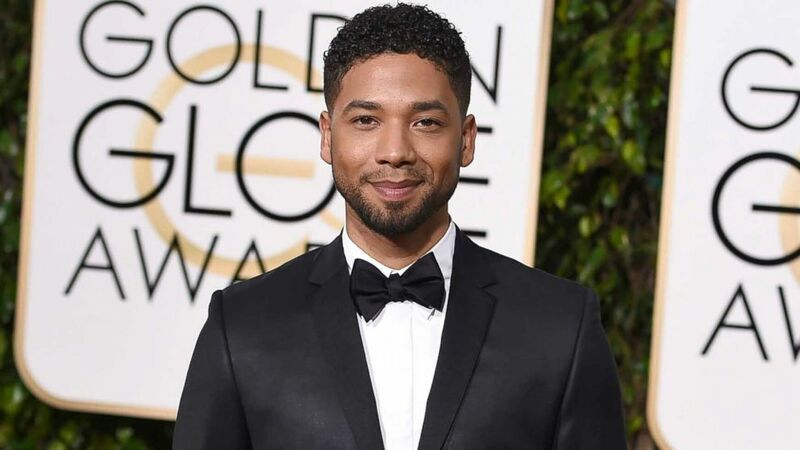 Though he did not say whether Smollett spoke to the men that night - one of them had previously appeared on "Empire" - he said it will also be central to the investigation whether they spoke to or saw Smollett. Police raided the home of the Osundairo brothers Wednesday night to search for possible evidence and retrieved shoes, electronic devices, bleach and a red hat, among other items, according to photos of an inventory log confirmed to ABC News. The inventory log, first reported by a local CBS station, also contained a description for an item that said "Script-Empire." It's unclear whether forensic results have come back on any of the seized items on the inventory log.